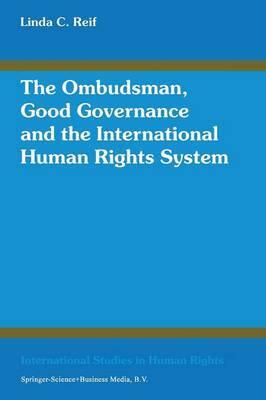 This book explores the role of the classical ombudsman, the human rights ombudsman and other hybrid or specialized ombudsmen in good governance and human rights protection at the domestic and international levels of governance. Chapters cover the ombudsman as a horizontal and vertical accountability mechanism, the role of the ombudsman in promoting good governance, the methods by which both human rights and classical ombudsmen can use international and domestic human rights law and act to promote and protect human rights at the domestic level, the interactions between domestic ombudsman institutions and the UN and regional human rights systems in Europe, the Americas and Africa, the establishment of human rights ombudsmen in post-conflict peace-building processes in El Salvador, Guatemala, Bosnia and Herzegovina, Kosovo and East Timor, the ombudsman for children, the workplace ombudsman used by some international organizations, ombudsman-like mechanisms used by international financial organizations to increase external accountability, the EU's European Ombudsman, and the factors influencing the effectiveness of an ombudsman institution. Selected case studies of classical, human rights and other hybrid ombudsman institutions in the various regions of the world are provided throughout the book.